Everything occurs in space and time, and therefore everything has a spatial dimension. Geomatics is concerned with the management of spatiotemporal information, and therefore is relevant to everything. As a globally recognized professional- and academic discipline, geomatics engineering integrates science, mathematics and technology in the provision of spatiotemporal information solutions for scientific, social, cultural, political, economic, and environmental problems. Geomatics engineers and professionals are employed worldwide in government agencies and private sector organizations, including international and multinational organizations such as the United Nations, oil companies, software companies, space agencies, airline companies, shipping companies, banks, telecommunication companies etc. In our department you can choose to pursue a B.Sc. 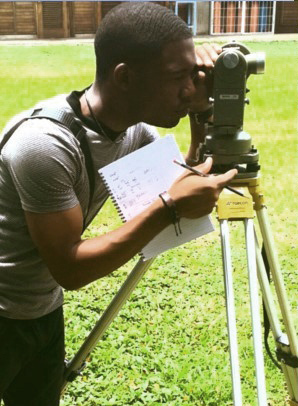 in Geomatics, or a B.Sc. in Land Management (with a valuation surveying focus). At the postgraduate level you can pursue M.Sc., MPhil, or Ph.D. degrees in Geoinformatics, or in Urban and Regional Planning. We also periodically offer a certificate programme in Geographic Information Systems (GIS) and a diploma programme in land administration. Specialized and tailored short courses are also offered to professionals interested in continual professional development, or to persons interested in gaining specific geomatics skills. Come join us and start (or continue) your geomatics engineering and land management future.